There are a few ways that you can extend the gardening season. The Montreal gardening season is so short so why not explore some of these methods. First off, you can use the floating row in the spring and in the fall to gain a couple degrees. This will enable you to plant your cool loving crops earlier in the spring and keep them in the garden later in the season. When planting more crops in the fall for winter garden, you want to consider the short amount of time you have left and choose varieties that will mature in 8 weeks such as leafy greens or radish. A winter garden is a way of extending the harvest season and not the growing season. When setting up the winter garden you want to start beginning of September or earlier so that they daylight hours are not too short. Once the daylight hours shorten enough (November), the plant stop growing – no matter how warm it is out. Once you have selected your varieties and planted you must choose the structure that you will build. When you step up any kind of structure you want to think about mobility. If your cold frame or tunnel is always in the same spot eventually it will build up pest and disease. Moving your installation gives you access to nature’s sanitation. 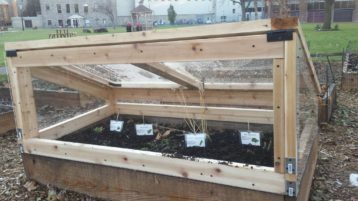 Consider where you are going to build or install your cold frame or tunnel. You want it to be easy access, so that once the snow comes you don’t have to shovel to get to your veggies. 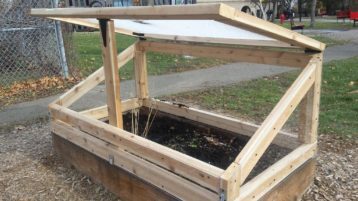 Building a cold frame is a great option. It is beautiful and can double as a nursery to start seedlings in the spring, summer or fall but be careful to vent on sunny days. You can also build a tunnel. You want to use two layers so that you can take advantage of the greenhouse effect. You can use the floating row and a plastic sheet that you place on wickets so that the tunnel is not touching the plants. If you are gardening in a raised bed, you can easily fasten your new tunnel. You want to sides to be able to roll up so that you can easily harvest. Harvest when plants are thawed between 10-2pm on sunny days. Enjoy your harvest! Starches are transformed into sugar (beets, carrots), leaves develop nice deep colours red and purple and have a nice crisp texture.